At Albar landscapes we specialise in commercial landscaping and can provide you with a complete, comprehensive service from concept to completion. Specialising in complex landscaping projects intended to impress, Albar Landscapes provide an all-inclusive landscaping service unmatched by our peers. 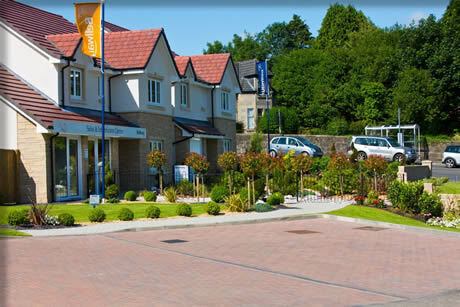 We have over 30 years’ experience in providing fantastic landscapes to commercial properties throughout Scotland and the UK. We also supply all of our own turf grown in some of the most fertile soil in central Scotland. We guarantee beautiful landscape design with healthy, lush turf as standard. As experienced Commercial Landscaping Contractors we have developed a comprehensive project managed Service that helps us to deliver exactly what our clients want time and time again. Why should you choose Albar Landscapes? Many of our commercial landscaping clients have been with us for many years, this is because we offer unbeatable flexibility due to our size, experience and the resources within our organisation, that we can offer our commercial landscaping clients.